Flip isn’t too impressed to be looking down on the Earth from this great height. I suppose if you see one planet from orbit, you’ve kind of seen them all, but that’s a rather blasé way of looking at things. Surely Flip still has a sense of wonder about her? But it seems that at the moment she’s thinking more of home, of her family – time and peril have caught up with her at last. She doesn’t regret what she’s done, or where she’s been, but she’s tired and wants to go home. And the Doctor is distracted too – for the last few plays there have been references galore to Peri and her uncertain fate post-Mindwarp. Flip can be forgiven for feeling that the Doctor’s attention isn’t entirely upon her. This isn’t a good combination. Mistakes will be made. Communication breakdowns. Whoops. Trying not to be too spoilery is hard with this one. Gallagher wastes no time at all in putting Flip in mortal peril, sending her off on a spacewalk with no tether and no hope, with only a voracious alien satellite for company. The Doctor has to deal with Salim and his brash, imperialistic (and casually racist) English counterpart Jessica Allaway as he attempts first to save Flip and second to deter Scavenger from causing more chaos. There’s no real success in either objective – Scavenger fries a huge chunk of New Dehli, while Flip… well, let’s just say that there’s a reason her spacesuit is called a Baumgartner. The character of Jessica Allaway – ex-Wimbledon champion, now overbearing representative for the ISA’s English sponsors and conniving to spoil the Salvage 2 mission – seems to unbalance the script somewhat. Not that she’s badly played by Kate McEwen (far from it), but next to the lost and doomed romance of Salim and Anarkali, and the Sixey/Flip dynamic, and the enthusiastic witness Jyoti Cutler (Anjli Mohindra), the character and her motivations just come across as a touch one-dimensional. The play doesn’t have a real villain as such – in some respects I’d contend that it doesn’t need one – and Allaway appears to have been put in there to tick that particular box. The rest of the plot is a clever blend of Who-style space opera (the Scavenger device, Anarkali, the resolution of that thread) and present near-space technology (they mention whippleshields! And I got the reference!). And Flip’s obligatory cliffhanger is the ultimate descent…. So is this it? Will there be any more Flip adventures? Can Big Finish possibly get away with leaving a companion like this? Is it a fate worse than death? And – what about Peri? 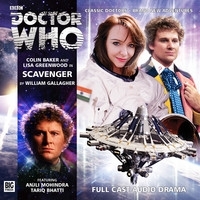 But meanwhile, to sum up Scavenger: it’s wonderful too see Big Finish creating some well-imagined near-futures, especially ones which don’t have a default Western culture setting. India is a plausible big-hitter in space operations and William Gallagher’s script and plotting is both tight and fresh in this respect. More diverse settings for the Doctor, please!